But, the spirits of many Georgians have not been shaken, which is one of the reasons why the annual Sunbelt Ag Expo has moved forward. Tuesday, thousands of people across America are in Moultrie for day one of the show. 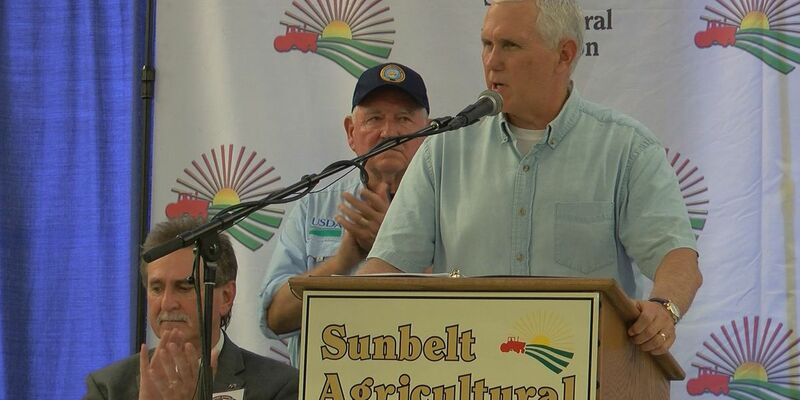 In the wake of Michael, United States Vice President Mike Pence made a special visit to the Sunbelt Ag Expo before visiting other communities devastated by the storm. The comradery amongst farmers and families alike has only strengthened since last Wednesday, which is something Pence has already noticed. In his speech he revealed how pleased he is with the resilience of Georgia farmers despite many of them losing one hundred percent of their crops. “All the farmers gathered here today in the wake of Hurricane Michael, we are with you and we will stay with you until we rebuild and recover better than ever before," said Pence. He describes Michael as a “once in a generation storm,” but assures us that farmers will be taken care of. Chip Blalock, Executive Director for the Sunbelt Ag Expo, recognizes how important this event is for the community and says he’s ecstatic that they didn’t have to cancel.